Today I worked this stitch with other TAST stitches to create some motif patterns . 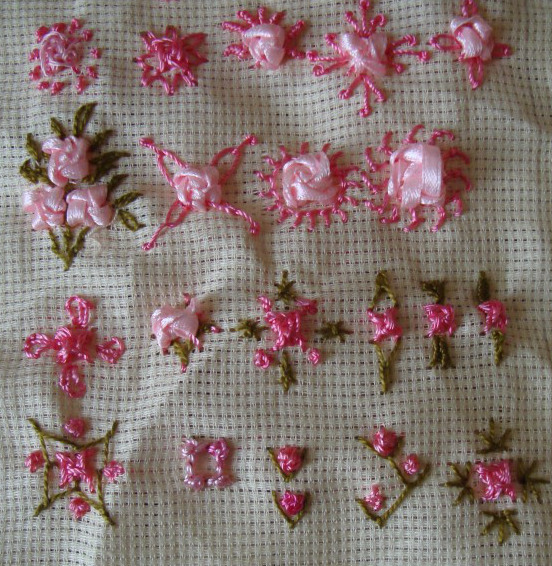 4.Details of these samples, this stitch is combined with- French knots, arrow head, bullion knots, pistil stitches and detached chain stitches. 5.The first sample is with stem stitch and detached chain leaves, the second one is with Italian border stitch, the last two are with buttonhole stitch and fly stitches. 6.The other stitches in these samples are- buttonhole wheel variation, Pekinese stitch variation, sheaf stitch, wheat ear stitch, whipped wheel variation and woven detached chain. 7.Cretan and herringbone stitches are worked as squares in the first two samples. Fly stitches, feather stitch and Algerian eye stitches are worked in the last three samples. These stitch combinations will be useful to use on decorative embroidery projects. This is a lovely stitch. This week’s stitch on the TAST 2013 challenge by SharonB is raised cross stitch flower. This is a new stitch for me. This challenge is showing new ways of working on familiar stitches. 1.In these samples the stitch is worked in different sizes[first four], in two colours and with different threads. 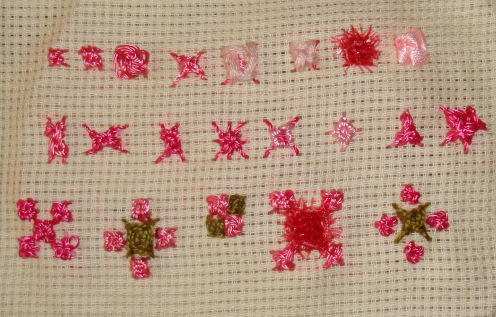 2.In these samples I varied the cross stitches –ablong , wide, double ,upright, triangle, and star-and worked over them. 3.Motif patterns were tried by placing the cross stitches differently. 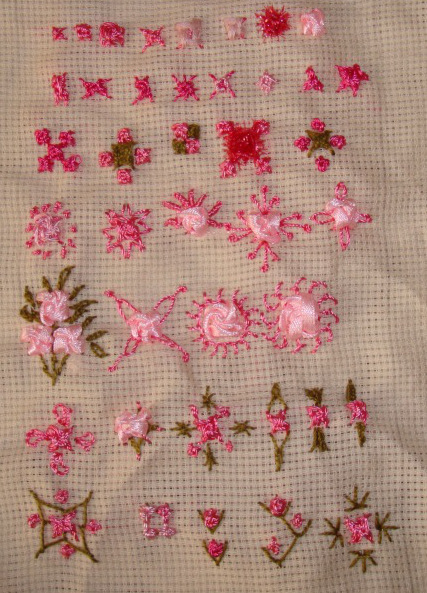 The last motif differs from the second motif, with upright cross stitches worked in pink.